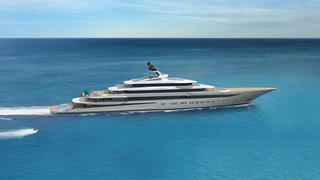 Superyacht designer Horacio Bozzo has revealed his latest concept, a 123 metre Fincantieri yacht called Private Bay. Announced at the Fort Lauderdale International Boat Show, Private Bay aims to provide a strong connection between the yacht and the sea. Accommodation is for 18 guests split across an owner’s suite and eight VIP cabins, while the crew quarters allow for a staff of up to 31 people. Exterior relaxation spaces are plentiful, with a pair of superyacht spa pools on the observation deck and afore of the owner’s suite on the main deck, which also includes a private office and his and hers en suites. 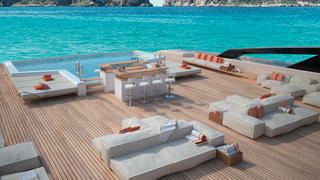 However, it is the stunning superyacht beach club that is most likely to catch the eye. This area totals 160 square metres and includes an infinity pool with swim-up cocktail bar, numerous sunpads and settees, an outdoor superyacht cinema and a fold-out staircase that provides easy access to the sea. A side-loading tender garage allows Private Bay to carry an eight metre RIB, a ten metre tender and an 11 metre limousine, as well as four Jet Skis. Power comes from a pair of 4,613hp diesel engines for a top speed of 18.5 knots and a maximum cruising range of 5,500 nautical miles at 13 knots.